A favorite adult book of mine is ABOUT A BOY by Nick Hornby. They also made a pretty good movie based on the book, and currently there is a bearable TV show a little more loosely based on it. There is one premise in the book that has always fascinated me and juiced my imagination. The main character, Will, a musician, is able to live a life bordering on hedonism because he doesn’t have to work. Years earlier he had written a song—a Christmas song, something about a reindeer—that became a classic and sells enough and is played enough every year that his royalties and/or residuals allow him to live a pretty carefree and stressless life. And in a very nice fashion. I often think about how cool it would be to have one book that sold large enough volumes year after year to allow me to pursue my writing and illustrating career without the burden and stress of financial concerns. Despite the blurring of the holiday seasons by the retail industry (Hey! Candy corn just in time for the 4th of July! ), I am still inspired to write holiday-specific stories during holiday seasons. Or at least seasonally-specific stories. And why not? They are a staple for the consumer, the retailer and the publisher. True, the window for sales is limited. Who is going to buy a Christmas book in March? Or August? Who is going to buy a book about jack-o-lanterns in January? And with the eyes of the publisher sharply focused on numbers, keeping your book in print becomes, I imagine, tantamount to seasonal CPR. Still, when the seasons roll around I am moved, maybe not so much by the retail world, but my own childhood memories, to pen something that recalls a magic I once knew. I can think of few things that would be as satisfying as creating a perennial classic that I would have loved as a child and later as a parent. I’ve written holiday or seasonally driven stories that I think are pretty good. One in particular had a first draft over 15 years ago and every year I still take it out and monkey with it. Over that time it has been bent and folded and shaped by several critique groups into what it is today. I think it is as strong as it might ever be and I truly love and believe in it. Though my critique mates have all given me the the thumbs up, ready for submission, my agent still isn’t convinced enough to shop it around. And I trust her judgement implicitly. She is looking out for both my career and my ability to move forward financially. But I think maybe if I dummy it up, if she sees it with pictures and understands the flow of the story that is in my head, she will change her mind. I’ve just never got around to doing that. The problem is this; I get excited writing holiday stories during a holiday season. Whether Christmas, Halloween, or even Valentine’s Day. But once that season has passed, just like the consumer, my interest in a seasonal story wanes. When that particular season comes back around I might pull out that manuscript once again, get excited all over about it, and rework it once more. Or maybe I’ll be inspired to start a new holiday-themed manuscript. But again, the season passes and so does my exuberance. Maybe that is best. Making a book that is only going to sell a few months out of the year may not be the most effective way to further my career or succeed financially. So, no matter how moved or compelled or inspired I am, no matter how brilliant an idea I have during a holiday season, I should resist writing that holiday story, right? Happy Holidays, Kevan! You are right— it’s hard to maintain the momentum needed to take a book from word to dummy. Whether it’s new projects and deadlines pulling us away, or a change of seasons, keeping up that inspiration can be daunting. But, personally, I hope you dummy up your book and wow your agent with it! Absolutely, Kevan–make that dummy! I love how holiday books can become part of family traditions. 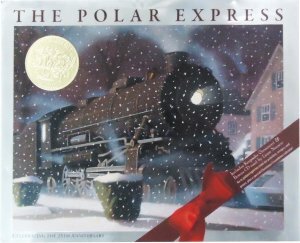 We pull our holiday picture books out each year, and still read a few favorites together even though my son is now 16. And while our collection includes Polar Express, my personal favorite is The Christmas Crocodile (Bonny Becker/David Small) — hilarious. You have three weeks to crank out that Christmas book dummy. Go! Do it, Kevan. Do it. It’s TOUGH coming up with a Christmas idea that hasn’t been done before. You can’t waste one.